The bare, upright shoots of this plant are covered in small clusters of deep pink, pea-like flowers in spring, creating a spectacular display just before the leaves start to emerge. Its bushy habit lends itself well to being trained as either a shrub or small tree, and as it is so compact, it will be happy in a very large pot for many years. The rich green, glossy leaves provide an attractive canopy throughout summer and turn buttery shades before they drop in autumn. Garden care: Plant in their final location when young as they resent being transplanted, and water well during their first year to encourage a good root system to develop. It requires minimal pruning, but you should remove any broken, diseased or crossing branches in late autumn or winter. When planting incorporate lots of well-rotted garden compost in the planting hole and stake firmly. Water well during their first year to encourage a good root system to develop. Saw bush on tv, able to identify it through website and purchased. Looking forward to it blooming this year. 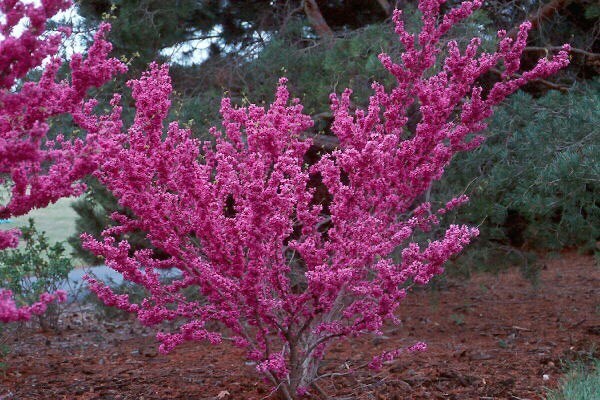 This plant is quite a wonder to behold when the beautiful bright pink flowers cover the branches. It has withstood the 2017/18 winter in Scotland beside the sea so is very hardy and has grown about 4 inches in a year. Other than watering it every couple of weeks in the summer I have left it to its own devices and it has been fine. Hello, It's difficult to say from your description, but the most likely causes are shock, planting too deeply, too much or too little water, or too much fertiliser. Perhaps you could email our customer services department with a photo and your order reference number and we could look into it for you. when is the ideal time to plant the tree? Hello there As a general rule plants that are grown in containers can be planted at any time of year as long as the soil isn't frozen solid. The best times are in the autumn when the soil is still warm enough to encourage root growth but the plant isn't in active growth, or the spring before the temperatures start to rise. This cercis is fully hardy, (although young plants can need protection) but because we are having a cold spell at the moment I wouldn't plant. You can still keep it outside in the garden in a sheltered spot, where it won't get blown over or caught by the frost until you can plant. Hope this helps. I hope this helps. I have seen this can be grown as a shrub or a tree. How do you train it into a tree? Hello, As the plant grows you simply remove the lower branches to form a clear stem (or stems) in late winter or early spring. The details for this item say it will be happy in a very large pot for many years. Please could you advise what size pot constitutes 'very large'. Thanks. Hello, It is difficult to be too specific, but I would opt for a pot at least 60 x 60cm (75 x 75cm would be even better!) and fill it with John Innes No. 3 compost.